It’s Raining Xbox 720 Docs! JDL: Yesterday, Chris and I despaired over there being a diminished (see also: none whatsoever) presence from Microsoft at the 2012 Tokyo Game Show. However, thanks to some leaked documents (now removed) that I Chris and I skimmed, our ill feelings have been pacified. 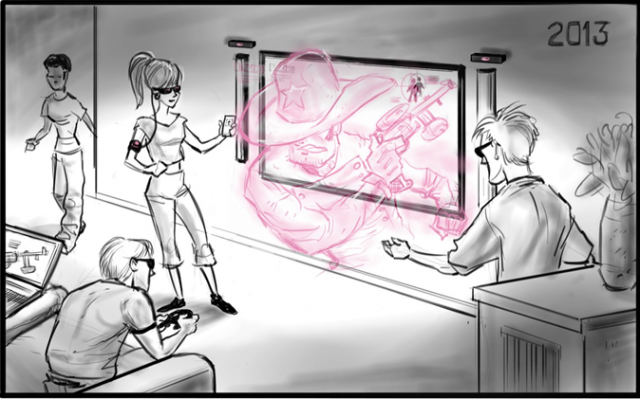 According to the docs, the new “Xbox 720” that will include a leveled up Kinect, head-mounted “glasses” display, and a focus on cloud gaming. The 56-page document states that Microsoft is supposedly gunning for a 2013 holiday season launch for the system with a $299 bundle plus new Kinect hardware and mentions a goal to sell 100 million units over the course of ten years. The document describes the “720” as being six to eight times more powerful than the Xbox 360, featuring six to eight 2Ghz ARM/x86 cores, plus two additional ARM/x86 cores to handle OS and three cores to handle backwards-compatibility functions. Well, there’ll be backwards compatibility! What a relief! Marvel vs. Capcom 3 for everyone! The documents also describes “SmartGlass” integration with phones and tablets, downloadable Xbox TV apps, and a Metro-inspired dashboard. Chris: Well hot damn, that’s a sweet deal, De Large! I don’t even care if the 720/Durango goes Skynet on us, an after next gen console than can do all that in a $300 bundle?! Sign me up.